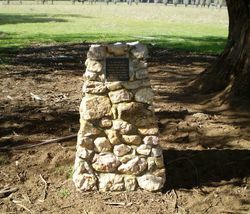 The local bushfire brigade erected a cairn of quartz stones in memory of Allan and Paul Rolles who lost their lives in the 1987 bushfires. 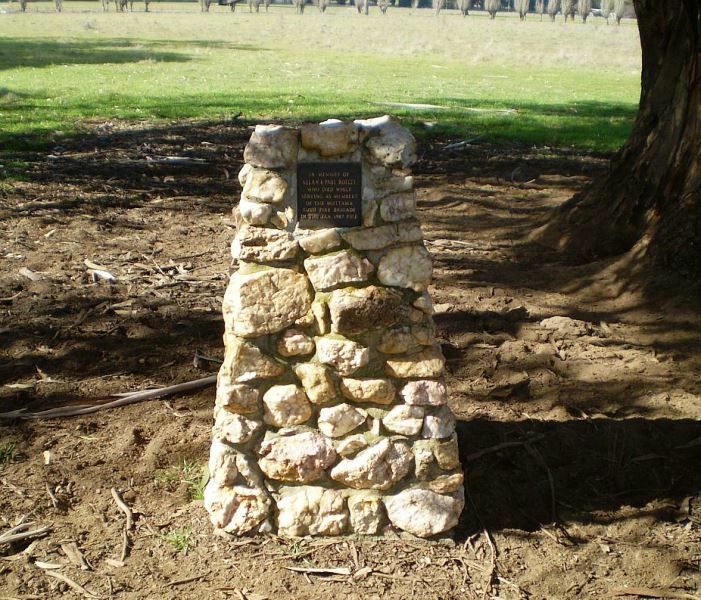 In 1987, on a hillside west of Cootamundra, a man cutting thistles and burrs struck a stone with a hoe and sparked a catastrophe. Dry and gusty westerly winds pushed flames through paddocks, across roads, beyond frantic firefighters. 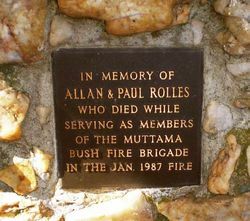 The inferno pushed east towards Muttama and in one tragic incident, a ball of flame enveloped firefighters Allan and Paul Rolles. Severely burned, the father and son drove back to their farm near Gundagai. Allan asked his wife Patsy to spray them with a garden hose. The men were treated in local hospitals then transferred by air ambulance to Sydney. Both died in the burns unit of Concord Hospital.